A study of almost 140,000 people conducted by the American Cancer Society has found that even low levels of walking are linked with helping people live longer. Walking is the most common type of physical activity in the United States and has been associated in previous studies with lower risk of breast cancer, colon cancer, heart disease, and diabetes. The American Cancer Society recommends adults have at least 150 minutes of moderate-intensity activity (equal to a brisk walk) or 75 minutes of vigorous-intensity activity (increases your heartbeat and breathing, and makes you sweat) each week. This is most effective when activity time is spread throughout the week. To help keep our community members active, Holzer offers the Walk with a Doc program at the Holzer Therapy and Wellness Center. This monthly event encourages healthy physical activity in people of all ages and reverses the consequences of a sedentary lifestyle in order to improve the health and well-being of the country. This is a free program and pre-registration is not required. The walk features a Holzer physician and other healthcare professionals who provide support and answer questions during the walk. The next walk is scheduled for Saturday, Sept. 15 at 11 a.m. and will feature Jonathan Mathis, MD, Pediatrician. 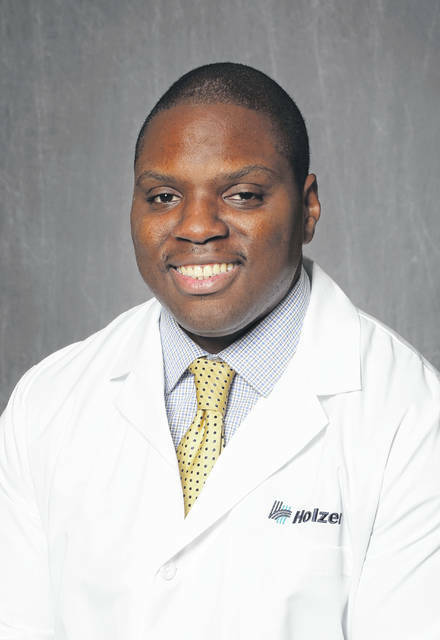 Dr. Mathis is accepting patients at Holzer locations in Jackson, Gallipolis, and Pomeroy. In addition to the Walk with a Doc event, Holzer Therapy and Wellness Center celebrates its second anniversary throughout the week of September 16th. A variety of activities are planned including door prizes, membership giveaway, apparel items available, and waiving the biometrics fee for any new enrollments during the week. The Therapy and Wellness Center, located at 735 Second Avenue, Gallipolis, Ohio, offers a walking/running track, state-of-the-art exercise equipment, a sauna, a shower and locker area, vending services, and a multipurpose meeting room for a variety of fitness classes and educational programs. Each enrollee of the Wellness Center undergoes a personalized health assessment to determine individualized needs and goals. The National Cancer Institute adds that walking may have beneficial effects for several aspects of cancer survivorship, such as weight gain, quality of life, and cancer recurrence or progression. Weight gain can occur due to reduced physical activity, or as a side effect of cancer treatments. Physical activity such as walking was found to reduce body mass index and weight, and increase survival rates for cancer patients. Being physically active after a cancer diagnosis has been linked to cancer-specific outcomes for breast cancer, colorectal cancer, and prostate cancer. Holzer Center for Cancer Care (HCCC) provides state-of-the-art treatment for all cancer sites with competent and individualized care. HCCC offers medical oncology services, including an infusion area for chemotherapy with 12 bays and two private bays for treatment. Radiation oncology services are provided with advanced technology in a relaxed and friendly setting. For more information about Holzer services, please call 1-855-4-HOLZER or visit www.holzer.org. Information submitted by Holzer Health System.